Federal prosecutors said in court on Friday that Michael Flynn called senior Trump transition officials at Trump's Mar-a-Lago estate on December 29 to discuss his conversations with former Russian ambassador Sergei Kislyak about the sanctions imposed by President Barack Obama on Russia that same day. As part of a plea deal, Flynn told the government that a senior member of the Trump transition team directed him to make contact with Russian officials in December 2016. The government did not disclose the identity of the transition official, according to the Associated Press. But Trump's son-in-law Jared Kushner was a senior member of the transition team and had met with both Flynn and Kislyak earlier that month at Trump Tower. Trump was also at Mar-a-Lago when Flynn purportedly called the transition team to discuss Kislyak on December 29, raising questions about whether he blessed or even directed Flynn to try to convince the Russians to hold off on retaliating on the promise that the sanctions would be reviewed once Trump took office. The Washington Post reported in February that Flynn had spoken to Kislyak about sanctions during the transition. Asked about that report at the time, Trump said: “I don't know about it. I haven't seen it...I'll look at that.” Flynn was asked to resign shortly thereafter, though Trump continued to defend him as a "wonderful man" who received "very unfair treatment." Former U.S. National Security Adviser Michael Flynn is escorted into a plea hearing at U.S. District Court, where he?s expected to plead guilty to lying to the FBI about his contacts with Russia's ambassador to the United States, in Washington, U.S., December 1, 2017. According to charges filed by Mueller's office on Friday, Flynn asked Kislyak "to refrain from escalating the situation in response to sanctions that the United States had imposed against Russia that same day." Kislyak later told Flynn that Russia "had chosen to moderate its response to those sanctions as a result of his request." Flynn apparently lied to the FBI about the conversations, telling federal investigators that he did not speak to Kislyak about the sanctions and did not recall Kislyak telling him that Russia would moderate its response. On December 30, one day after Flynn spoke to Kislyak and told Trump transition officials about it, Putin announced that Russia would not retaliate. "We will not create problems for US diplomats," Putin said in a statement. "We will not expel anybody." Hours later, Trump tweeted: "Great move on delay (by V. Putin) — I always knew he was very smart!" The revelation sheds new light on the White House's reaction — or lack thereof — when former Acting Attorney General Sally Yates warned White House counsel Don McGahn that Flynn had misled Vice President Mike Pence about his calls with Kislyak. Yates testified earlier this year that she warned McGahn so that he "could take action" amid concerns Flynn could have been subject to blackmail by the Russians. "We told them that the conduct Flynn had engaged in [speaking to Kislyak] was problematic in and of itself," Yates recalled. "We said that the vice president was entitled to know that the information he was giving the American people was not true. And we told him we were concerned that the American people had been misled about what General Flynn had done, and that we weren't the only ones who knew about this." 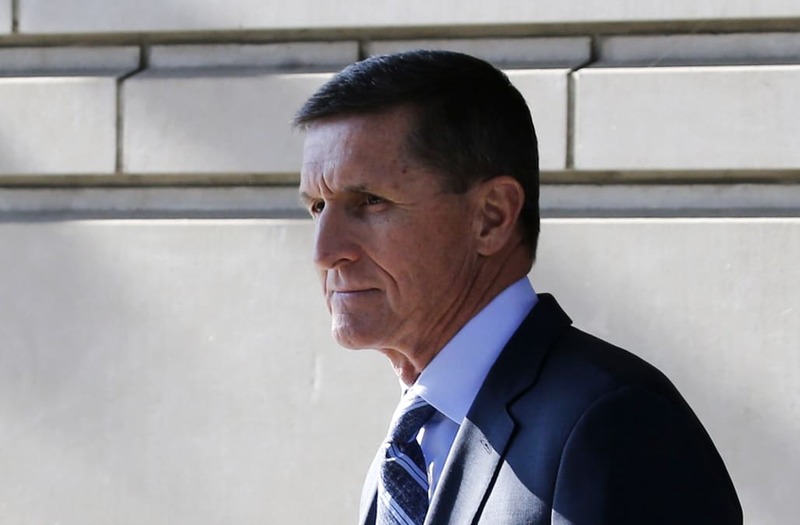 Flynn said in a statement on Friday that he is "working to set things right." White House special counsel Ty Cobb, who has been representing Trump in the Russia probe, characterized Flynn as "a former Obama administration official" in a statement on Friday. "The false statements involved mirror the false statements to the White House officials which resulted in his resignation in February of this year. Nothing about the guilty plea or the charge implicates anyone other than Mr. Flynn."